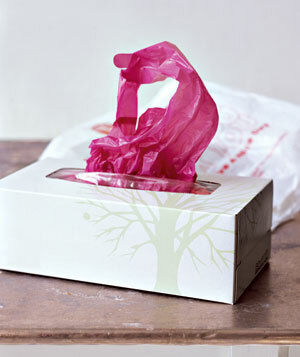 Real Simple suggests you store the plastic bags in an empty tissue box. I have tried this before and found it was annoying to put the bags in the box. But if you only reuse a few plastic bags, this might be a perfect solution for you. In a similar vein, Nàe Chic recycled a disinfectant cloth containers by making it into a container for her “doggie poo bags.” But it could work for plastic grocery bags too. 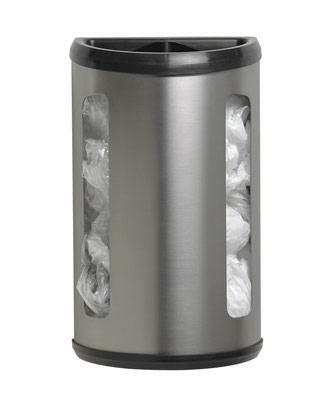 Woman’s Day informed me of this “easy-to-hang container has a self-adjusting divider and holds up to 50 grocery bags.” While I wouldn’t buy a special thing just to hold the grocery bags, but this would solve my plastic bag storing needs. Instead, I might keep my eye open for a flip-top garbage can at the thrift store. 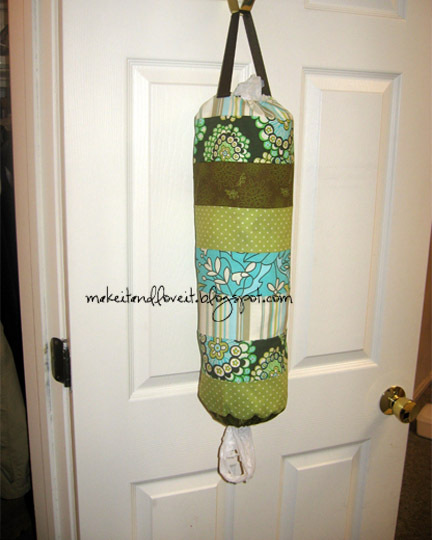 Finally, Make It and Love It has a tutorial for making your own grocery bag holder. You put new bags at the top and pull them from the bottom. It’s attractive too. How to do store your plastic grocery bags? You can also buy on similar to the last one (from make it and love it) for $1 at a dollar store. Z, thanks for the tip. I’ll have to keep my eyes open. I fold my into triangles (think of folding a flag is how someone described it to me once) and then I store in a big gift bag under the sink. Saves a TON of space! I also fold the bags into a long strip and then tie them into a knot. equally just as small. This is what I do to differentiate between the ones that have holes and the ones that don’t. The ones with no holes get used in the kitchen, the rest get used anywhere else. a long time ago i saw this in home journal. use a large dia. plastic pvc put a cap on bottom,cut a half moon slice towards bottom. mount on wall load in bags pull from bottom. sorry all i remember. good luck. sam st.pete. i`ll keep looking. Thanks so much for linking up! I shared on my FB wall! Thank you! Hi Tabitha, thanks for including me. Pingback by A List of Clever Tips and Tricks to Make Life Easier! Pingback by 25 Clever Ideas To Make Life Easier! Pingback by 25 ideas how to make your life easier « There is a road from the eye to the heart that does not go through the intellect. Pingback by Clever Ideas We Love for Food and Home - S. Jackson Inn B&B | Why stay in ordinary Harrisonburg, VA hotels? I cut a hole in a gallon jug (laundry or orange juice jugs work well) about 3-4 inches in diameter. It works great. Cut carefully with an exacto knife or sturdy scissors I also use a big vase, the kind that holds a dozen roses. It doesn’t hold as many bags, but it looks nice. Vases can be found at thrift stores for practically nothing. A ceramic pitcher would work as well. My mom used to stuff them in the cardboard tubes at the center of a roll of paper towels: re-uses the tubes as well as stores the bags. You can fit a surprising number of bags into those tubes. Pingback by Clever Ideas « Make Something Mondays! WOW! Hello, who would of thought to use some of these ideas! Now I can stop piling those bags everywhere! Clean up is a cinch now! Pingback by Simple Ways to Make Your Life Easier | Benoit Real Estate Group Blog Your number one source for finding homes in Somerville MA Real Estate, Cambridge MA Real Estate, Arlington MA Real Estate, Middlesex County Real Estate, and surrounding towns. Pingback by Simple Ways to Make Your Life Easier | Your number one source for finding homes in Brockton MA Real Estate, Easton MA Real Estate, Randolph MA Real Estate, Bristol County Real Estate, and surrounding towns. Pingback by Simple Ways to Make Your Life Easier | Dino Rossi - Finding homes in Newton MA Real Estate, Waltham MA Real Estate, Watertown MA Real Estate, Middlesex County Real Estate, and surrounding towns. I crochet the bags and made outside door mats, grocery tote bag for my fruits and veggies, and a fruit bowl for my dining table. They call it “Plarn” they have a lot of free patterns online.